Tricovel® with Biogenina has a triple action affect in decreasing temporary loss of hair due to Telogen Effluvium a reversible hair loss condition. 1. Tricovel decreases temporary loss of hair due to Telogen Effluvium (a reversible hair loss condition). Tricovel reduces hair shedding, as the hair shedding consistently declines after only two (2) months of treatment. Tricovel® reduces the hair found in the sink after washing by *-75.7%. In a clinical study of 60 patients comparing Tricovel® to placebo, Tricovel® showed significant hair loss reduction as Tricovel® decreased the number of hairs lost by *-75.7%. 2. Tricovel increases the anagen (growth) phase of the hair cycle and decreases the telogen (rest) phase of hair growth cycle. Tricovel increases hair volume and promotes hair growth and re-growth. Tricovel tablets with Biogenina increases the amount of hair in Anagen (growth) phase by *+20.2%. 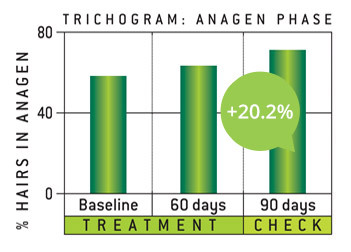 A clinical study of 60 women with Telogen Effluvium demonstrated that Tricovel® increases hair growth by *+20.2% with a 2-month treatment compared to a placebo. The hair continued to grow after treatment stopped. 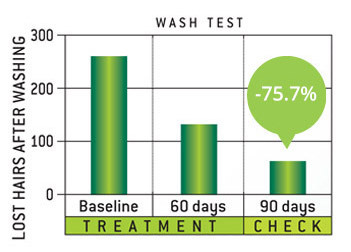 Through Hair follicle assessment Tricovel® increased hair growth by prolonging the Anagen and hair growth phase. 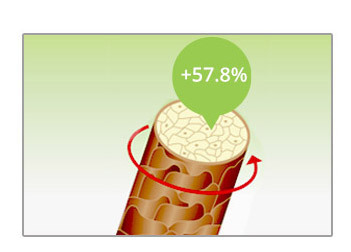 Tricovel increases hair volume increases hair shaft diameter by *+57.8%. In a clinical study of 60 women with Telogen Effluvium, those taking Tricovel® for 2 months had a *+57.8% increase in hair shaft diameter. This leaves the hair looking thicker and fuller. Tricovel® only needs to be taken once a day for 2 months as it contains a sustained release technology. This means that Tricovel® keeps working even when you don’t’ take it anymore. Results achieved with Tricovel® won’t be lost after you stop taking it.